The Gilliam House is a mixture of Spanish Colonial and Georgian Revival styles. 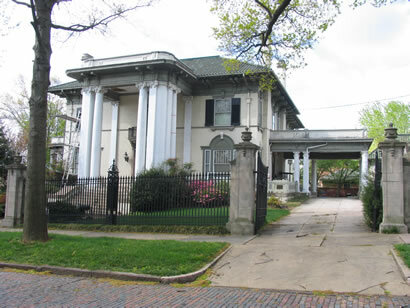 The house was built in 1913-1914 for $86,000 by architect Stanhope Johnson for James R. Gilliam, Sr., president of six Virginia banks, five coal and coke companies, and of the Lynchburg Shoe Company. Two frame homes originally standing here were demolished to make way for this imposing structure, the last of the great mansions built on Garland Hill. The conversion to apartments in 1959 ws made easier by the presence of the five original complete bathrooms in the house. The house was restored to a single family residence in 1990 and for several years was used as a bed and breakfast. The front door opens onto the 50 foot grand hall with soaring celings and cherry columns and wainscoting. The house won the Lynchburg Historical Foundation Award for exterior renovation in 1985.